I knew my journey had really begun as I found myself in a classroom on Nurmijärvi Campus on a sunny September morning in 2018. As I looked around the room, there were 20 friendly smiling faces – the atmosphere was warm and inviting. We were a mixed bunch of men and women of various ages from: Finland, Europe, Israel, Asia and Canada – all drawn together by our desire to become adventure education professionals. All keen to be part of a brand new course – the first university course in Adventure Education (AdEd) in Finland. We were making history! Some say (and, yes, instructor Kai – I mean you!) that all human behaviour can be controlled by either bribery, threat or blackmail. Fortunately, bribery was top of the list and we were handed the simple, yet profound, gifts of a compass and a waterproof notebook. It was a good start. To me, this spoke of many things: we were going to be active; we were going to navigate our own course; we were training to be leaders. Our decisions would mater; we would be recording important information and observations for reflection. We were being empowered. Now I had some tools for my journey and I felt so glad to be here. Our first weeks were action packed and very much about “learning by doing”. We would get to know the place and – crucially – each other, through a series of games and challenges. As AdEd pedagogy teaches that play is learning, we were about to do some serious playing! 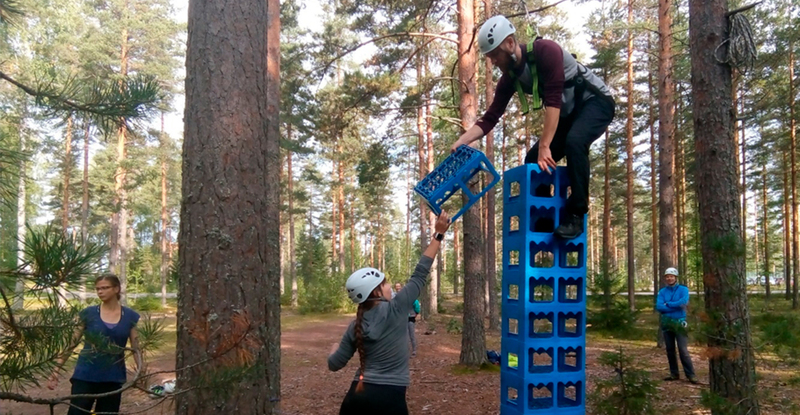 Brought together with the Erasmus students, we dived into numerous fun and team-building games: exactly the sort of activities that we would need in order to bond as a group. Also (of course deliberately), we were already stocking up our own bag of tricks that we could use when instructing groups. There were warm-ups, ice-breakers, games that involved touch, trust, communication skills, strategy, even shrinking icebergs and herding lost sheep… And plenty of laughter! We tackled low rope challenges, which required real teamwork and gravity-defying box climbing, which was all about challenging yourself within a safe and supportive environment. As you can see in the photos, we had a lot of fun with these! At the same time, we were able to glimpse the character of our new friends as we started our student life together. Humak Nurmijärvi AdEd 2018, photographer: Benjamin Hammond. In the second week we went canoeing the crystal clear waters of our local spring-fed lake, Sääksjärvi. 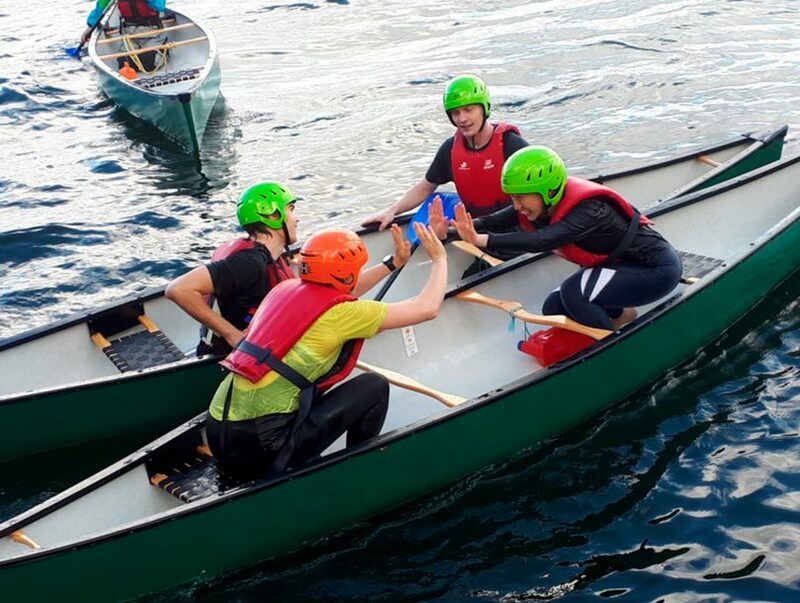 There was a big difference in our individual canoeing levels: some were already professionals; and some were canoeing for the very first time. But for all there was the opportunity to learn: the basic skills and from the instructional approach of our teachers. The weather, however, is not something in our control. On the second day it became really windy and it was impossible – even dangerous – to paddle against the sea-like waves. This was, though, the perfect opportunity for our experienced instructors to demonstrate a key tenet of experiential learning: adapting to circumstances. Humak Nurmijärvi AdEd 2018, photographer: Milla. Right here is the perfect blog for everyone who would like to find out about this topic. You realize a whole lot its almost tough to argue with you (not that I personally would want to…HaHa). You definitely put a new spin on a subject that’s been discussed for decades. Wonderful stuff, just excellent! The very next time I read a blog, I hope that it doesn’t disappoint me just as much as this one. After all, I know it was my choice to read through, nonetheless I truly believed you would have something useful to say. All I hear is a bunch of moaning about something that you can fix if you weren’t too busy searching for attention. You’re so interesting! I do not think I have read a single thing like this before. So great to discover somebody with some original thoughts on this issue. Really.. thanks for starting this up. This web site is something that is needed on the internet, someone with some originality! bCa5XF This blog is obviously entertaining and besides informative. I have chosen a bunch of interesting stuff out of it. I ad love to visit it again and again. Thanks! I3MCgy Say, you got a nice blog article.Much thanks again. Keep writing.